Rubenerd: #Anime Bakemonogatari’s wild success! News stories are spreading like some sort of fire (a wild one I presume) that initial sales of the Bakemonogatari DVDs and BluRay discs have not only outsold the disastrous and missed opportunity that was the second season of Haruhi, but even K-On! 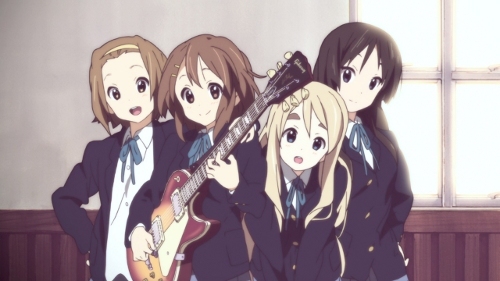 In real terms outselling Haruhi didn't surprise me, but beating the K-On with its huge impact on popular culture (sales of musical instruments, shimapan bowls and whatnot) was quite an achievement. There seems to be two streams of discussion online about this that I would argue are actually the same thing, but people aren't treating them as such. The first is, despite beating the Kyoani war machine, Shaft still didn't sell as many as any series that have super robots. Fair enough, everybody expected that because they're two completely different genres and types of shows. Then the same people turn around and start arbitrarily discussing how much better Bakemonogatari is to both K-On and Haruhi. Let's get one thing straight; I have adored Bakeomonogatari. I think it's been one of the freshest, most interesting series I've seen since I started watching anime again, and Shaft are to be commended for their successful adaptation. I expected no less from the studio that brought us the brilliant Sayonara Setsubou-Sensei! 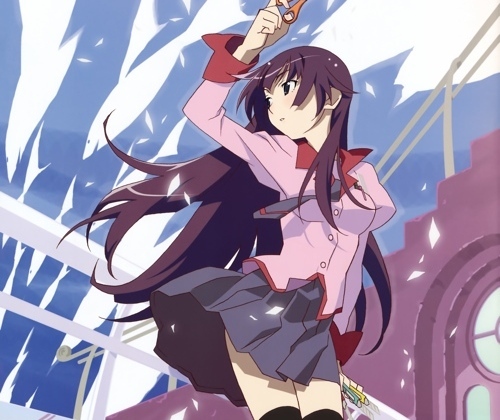 That said, I'm of the opinion that arbitrarily comparing Bakemonogatari to both Haruhi and K-On is almost as silly and meaningless as comparing Bakemonogatari to shows with super robots. I preface my proposition with almost because I do concede there is perhaps more of an audience overlap between Kyoani's shows and Shaft's, but my point stands. Mostly. While I admit I adore K-On and thought the first season of Haruhi was far more interesting than anything else coming out at that time, the first is mostly an unabashed moe blob series and Haruhi for all it's time travellers and espers and universe creation was also largely a slice of life show as well. I think it's safe to say both were comedies. Bakemonogatari has it's lighthearted, fun moments, but it'd be quite a stretch to call it a moe blob series or a comedy. The Bakemonogatari universe is also fundamentally different, and aside from anything else comparing the art in it to any other series (perhaps aside from Sayonara Setsubou-Sensei!) is just unfair! Am I completely wrong? Probably. I just wish people could celebrate the incredible success and achievement Shaft have had with their superb new series without instantly saying it's because it's "just better". A fine bottle of Barossa Valley red is better than a can of Coke, but that doesn't mean the comparison means anything :P.